"Lā ʾilāha ʾillā llāh, Muhammadun rasūlu llāh"
↑ Dictionary.com. The American Heritage Dictionary of the English Language, Fourth Edition. Houghton Mifflin Company, 2004. Reference.com (Retrieved 13 November 2007). ↑ Dictionary.com. WordNet 3.0. Princeton University]]. Reference.com (Retrieved 13 November 2007). Archived 28 March 2014[Date mismatch]वेबैक मशीन पर . 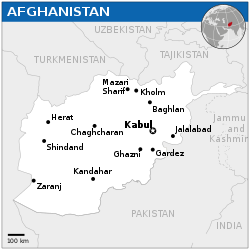 ↑ Central Statistics Organization of Afghanistan: Statistical Yearbook 2012–2013: Area and administrative Population Archived 17 December 2015[Date mismatch]वेबैक मशीन पर . ↑ "The World Factbook — Central Intelligence Agency". 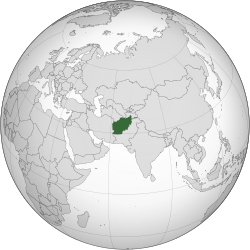 ↑ 5.0 5.1 5.2 5.3 "Afghanistan". International Monetary Fund. पहुँचतिथी 26 अप्रैल 2014. ↑ "Gini Index". World Bank. ओरिजनल से 11 मई 2014 के पुरालेखित. पहुँचतिथी 2 मार्च 2011. ↑ "2015 Human Development Report" (PDF). United Nations Development Programme. 14 दिसंबर 2015. प. 18. पहुँचतिथी 14 दिसंबर 2015.